0.1 Where can I check out a clicker? 0.2 How do I use my clicker? 0.3 How do I change the channel number on the clicker? 0.4 I don’t think my clicker is working. What should I do? 0.5 Does Yale offer clickers to the visually impaired or blind? 0.6 I’m taking two classes that use clickers. Do I need more than one clicker? 0.7 Where do I return my clicker when I am done using it? 0.8 What if I lose my clicker? Where can I check out a clicker? Yale College students enrolled in classes using clickers may check them out from the Bass Library circulation desk. The circulation desk is open Mon-Thurs 8:30 am – 11:45 pm, Friday 8:30 am – 9:45 pm, Saturday 10 am – 6:45 pm, Sun Noon – 11:45 pm. How do I use my clicker? Each clicker has 12 buttons used for different functions. See Key for descriptors. The User Feedback button is used as a way for the presenter to gauge the class for questions. In essence, the button acts as a virtual raising of the hand. How do I change the channel number on the clicker? Press and release the Ch button. As the light flashes red and green, press the “4” button and then the “1” button until the light turns amber. Press the Ch button again until the light turns green. Press and release the “1” button. The light should flash amber to confirm. 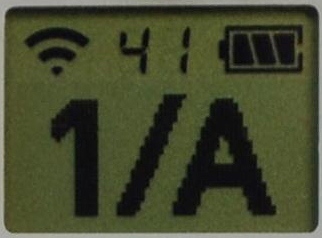 Verify the channel number at the top of the LCD screen. I don’t think my clicker is working. What should I do? If nothing is displaying on the LCD of the clicker, the battery might be dead. Return the clicker to the Bass Library circulation desk for battery replacement. 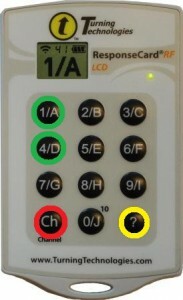 Ensure your clicker is set to channel 41 by pressing the Ch button and looking at the top of the LCD screen. If “41” is not displayed, you can change the channel by pressing the Ch button, pressing 4 then 1, and then press Ch again. Your clicker will flash green if the channel has been reset. Verify the channel number has been reset by pressing the Ch button (see previous FAQ for additional information). If the no symbol (Ø) is displayed on your LCD clicker when polling, your responses aren’t being registered. * The most likely reason is because your clicker is not set to the right channel (41). Another possibility is that your instructor’s receiver may not be functioning correctly to which you may consider informing him/her. *If using an older clicker without the LCD screen, an indication that polling answers are not being registered is by the LED light consistently flashing between green and red. You may consider getting a replacement LCD clicker from the Bass Library. Does Yale offer clickers to the visually impaired or blind? Yes. Upon request, special Braille clickers can be check out from the Bass Library circulation desk or obtained from Judith York of the Yale Resource Office on Disabilities. The clickers not only provide a Braille character keypad, but also come equipped with a vibration motor that pulses when buttons are pressed to indicate successful response detection. For more information and specifications on the clickers, please visit the manufacture’s web site. I’m taking two classes that use clickers. Do I need more than one clicker? You only need one clicker. Your clicker will work in all of the Yale College classes that use clickers. Where do I return my clicker when I am done using it? If you checked out a clicker from the Bass Library, return it back to the Bass Library circulation desk. Please do NOT return clickers in library drop boxes or at other libraries as this may result in a damage or loss fee. If your clicker is lost or damaged you will be responsible for the full replacement fee. What if I lose my clicker? Don’t panic! You have until the end of the semester to find it. In the meantime, visit the Bass Library circulation desk for a replacement clicker and check your library account status on the Yale Library Orbis page in case your clicker was returned back to the Bass Library. If the lost clicker is not returned by semester’s end, a $65 replacement fee will be charged to your student bursar account. © Classroom Polling. Powered by WordPress & WPstart Theme.